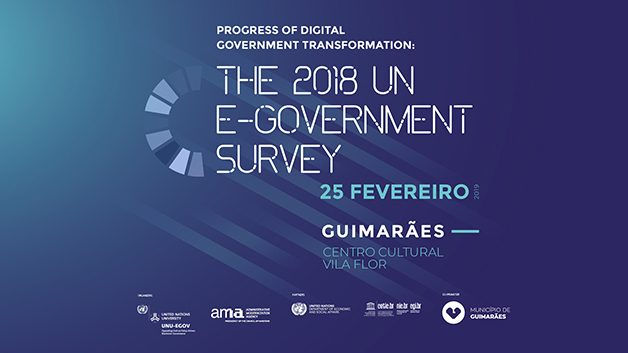 The United Nations University Operating Unit on Policy-Driven Electronic Governance (UNU-EGOV) and the Portuguese Administrative Modernization Agency (AMA) are co-organisers of the international conference on Progress of Digital Government Transformation: The 2018 UN e-Government Survey, to be held on 25 February 2019, between 10-17h, at Vila Flor Cultural Centre, in Guimarães. This event, which will be attended by international organizations such as the UN, OECD and CETIC.br/NIC.br, will address the international progress in the development of e-Government and the official launching of the Portuguese version of the 2018 UN e-Government Survey, conducted by the United Nations and which places Portugal in the group of countries with very high EGOV development. Announcement of the exchange of letters between UNDESA and UNU-EGOV. 14:30 | KEYNOTE: EGOV Evolution – What Does a Longitudinal Analysis of Ten UN e‑Government Surveys Have to Say?